Jack Holder won't now be representing Panthers in the SBG Championship Fours. Peterborough Panthers will go into SGB Championship Fours battle without their best rider tomorrow (August 6). 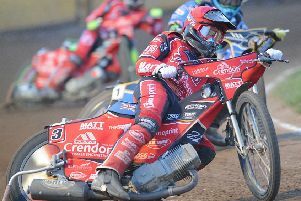 The city club have given number one Jack Holder permission to miss the annual event at the East of England Arena (2pm) so he can race in the Polish Ekstraliga – arguably the best league in the world. Bradley Wilson-Dean replaces Jack Holder in Panthers' team for the SGB Championship fours. Holder was initially allowed to ride over there for the Torun club last weekend and produced a stunning 13+3 performance in a loss to Leszno – now they want to use him again as a replacement for injured world champion Greg Hancock. And while his decision has no doubt lessened Panthers’ chances of capturing silverware, Panthers promoter Ged Rathbone insists it is the right thing to do. Rathbone said: “We have agreed with Torun that Jack can race for them tomorrow. “We have to accept that we are simply a stepping stone in the career of a brilliant young rider. “Ourselves, Torun and Jack have come to an agreement that suits us all. Torun did initially ask us to release Jack for the rest of 2017, but the rider himself refused that. “Jack has been a model professional from our very first phone call to him during the winter. He loves racing for Peterborough and he has already indicated that he wants to be back with us again next year. “I fully understand that some of our supporters may be disappointed that we are without Jack tomorrow in the Fours, but I ask them all to understand that the deal we’ve done is beneficial to all parties. Bradley Wilson-Dean will now step into the Peterborough team for the SGB Championship Fours along with Chris Harris, Paul Starke and captain Ulrich Ostergaard. Simon Lambert now acts as their reserve. Rathbone admits Holder may also miss two upcoming SGB Championship league meetings as well if he continues to be wanted in Poland. The Panthers supremo also accepts it is now unlikely the city side will make it into the play-offs. They find themselves 15 points off the top four. “We feel as a club that after last night’s result in which Sheffield won at Edinburgh, we will not now make the SGB Championship play-offs this season,” added Rathbone. “Granted, it’s still mathematically possible, but it is a slim chance at most. Holder is not the only top rider to be missing the Fours. Edinburgh star Sam Masters and Newcastle ace Robert Lambert are both injured.